Zombie debt can be the result of honest error, but requires even more vigilance and persistence to solve than other forms of debt collection abuse. The problem of zombie debt makes it even more important to monitor your credit score on a regular basis. Negative marks on your credit report are generally removed after seven years and cannot be used as the basis of your credit score; a debt collector can attempt to manipulate this by telling credit agencies that an old debt is a new one. If the debt has “changed hands”, this ruse could go undetected unless you catch it yourself. There are three major credit reporting agencies: Experian, Equifax, and TransUnion. The best information is obtained by reviewing your reports from all of them on a regular basis. Luckily, under the Fair Credit Reporting Act, you are entitled to a free credit report from each agency once every 12 months. The official web “hub” for ordering a complimentary report from any or all of the three agencies is AnnualCreditReport.com. If you find an error on your credit report, it’s up to you to dispute it with the three agencies. Remember: zombie debt abuses are based on the idea that you won’t fight back! If you believe a debt collector is intentionally engaging in unfair practices, whether in regards to credit card debt, household bills, or any other transaction, communicate with them only in writing and keep copious records. Consider retaining an attorney: many zombie debts are related to violations of the Fair Credit Reporting Act, a federal law that can carry stiff penalties for those who do not follow it. Another important thing to remember is that there is a statute of limitation to any debt. After the statute of limitation, creditors and debt collectors can no longer take legal action in pursuit of the debt. The specific amount of time in each case varies by state and by the type of debt under consideration; however, every debt has a limit, and the countdown generally begins within a short time after the account first goes delinquent. 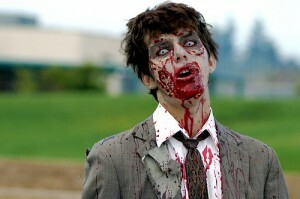 Have zombies lurking around your credit report? Share you zombie stories and zombie fighting tips.